Barcode Scanners: What are QR Codes and Microsoft Tags? As print publications expand their reach to include an online presence, it’s crucial for them to bridge that gap for readers as easily as possible. Many schools have begun to include web reefers within their print publications. These are little blurbs that tell readers for more information they can go online and a URL is given. 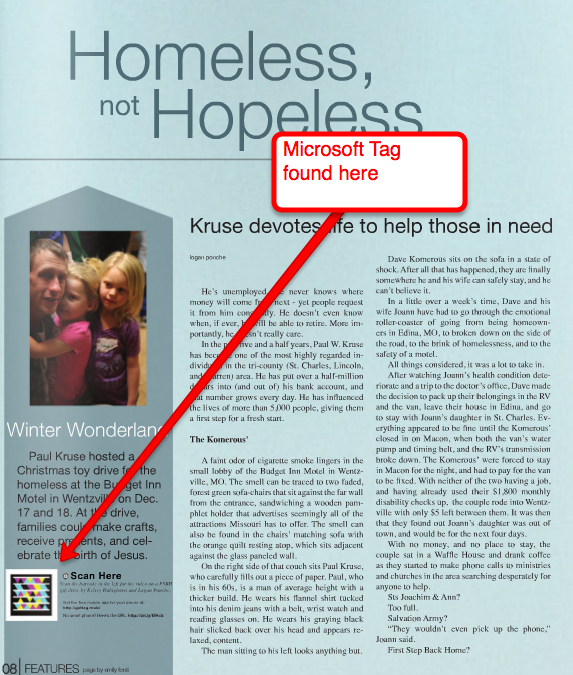 QR Codes and Microsoft tags actually take that idea a step further and make the process even simpler for readers. Over the next few weeks I’m going to post a series of pieces on these barcodes. This QR Code in the Feb. 27, 2011, St. Louis Post-Dispatch lead readers to an online Oscar Bingo game. To set a bit of a base here, while there are many types of barcodes, I will mostly be focusing on QR Codes and Microsoft Tags. They are essentially the same thing and I will probably use their names interchangeably at times (even though they are a bit different). QR Codes are license free versions of these barcodes, whereas the Microsoft Tags are licensed and maintained by Microsoft. Both though serve the same purpose – to act as barcodes for barcode readers or camera phones. If your staff has a web presence and a print publication, you should be using them. Today’s post will be a bit of a primer on what these things are. The codes have been in use for a few years, but I think QR codes first clicked with me in early 2010 when I saw a copy of Self magazine. There was some sort of piece in the magazine on a toning exercise. The print piece talked about how to do the exercise and showed a couple of photos. It also included a Microsoft Tag though. I read about the barcode ‘tag’ and realized if I downloaded a free app to my smartphone, I could scan this Tag and it would send me to a website where there was a video showing me how to do the exercise. While I never gave two thoughts to actually doing the exercise, my mind did begin to race with the potential for this. 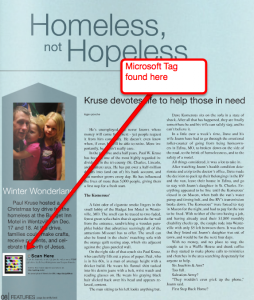 This is a Microsoft Tag that took readers to a story video story about an event Paul Kruse hosted for the homeless. I brought the idea up to my staff at our summer camp that June. As with most ideas I give them, they thought it was cool and moved on to something else. Most of the reason I moved on with it as well was because I didn’t have the time to learn how to create one of these. I thought it took some degree in rocket science. A local teacher pinged me in December asking me if my students were using them. I said, ‘No’ and asked if she’d come teach me how to create them. After I hit the send button on that message, I realized I’d never actually researched how to create one. So, I pulled up a Web browser, Googled it, and 10 minutes later I was an expert. Kind of. Ha. I showed my staffs how easy it was to create one and they were hooked as well. Since then, my newspaper staff has used Microsoft Tags in the last two issues, directing people to videos and other content on the web that helps expand the print content. The yearbook staff has adopted them as well and will be using tags to showcase supplemental video content instead inserting a DVD into each book. QR Codes and Tags = Free. DVD creation and insertion = not so free. For this post, let’s just take a look at what QR codes and Microsoft Tags are. We will explore more specifics and current practices with them in later posts. We will also talk about things like making sure people who don’t have smartphones can still access the content easily. There is a lot of data out there on what these things are and what they do. 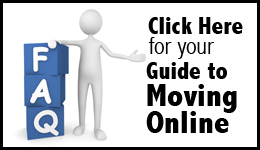 Here are a few links to get you started. If you have any experience with Tags or QR codes I’d love to hear about them and work to feature your students work in upcoming posts. Just send me an email or message me on Twitter or Facebook. 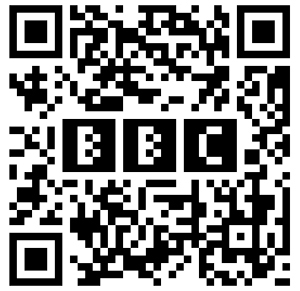 Here is a QR Code that will take you to the BBC website. Download a QR Code reader on your smartphone or iPod and try it. 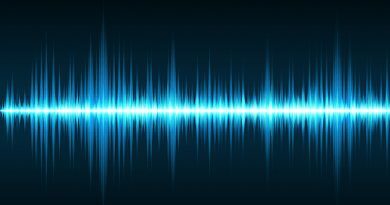 Audio is just as important, if not more, than the video. I was excited to see this post…we just put our first QR code in our paper this week. So cool! Just saw a link to this article at the Walsworth site where I posted the following: Wanted to say we are making our first foray into adding content and coverage to our book this year. While admittedly not a Walsworth publication, we aren’t tied into any one publisher for our codes anyway. We have been working with yearbook unlimited to make sure we know what to do and that everything works as it is supposed to. Anyway, we have been educating our students about QR Codes throughout the year. In fact, we are going to give away an iPod Touch soon using QR Codes as part of a “Treasure Hunt.” We didn’t want to spring these strange little mazes at them without having exposed the student body to them beforehand, but I think in a year or two they will be ubiquitous and everyone will know about them anyway, especially with smartphone adoption rising so quickly. We are excited about it. In fact, we are using them to phase out the DVD we used to always include with our book. If anyone has any questions about our experience, feel free to email me. Take promoting your “name”, BIZ, hobby, music, self, etc.. , with QR Codes and mobile technology to the next level. Come see why our patent application is the most dynamic digital web to mobile communication that will enable you to promote, change, edit, update any of your information while using the same TAG or QR Code forever. Save time, save money and keep people connected to all your social media, contact information and more using Scantac. Scantac – Changes with you!